Stocks in several Asia-Pacific markets came back from early declines Thursday as interest in cheap buying opportunities started to push back concerns over trade protectionism. 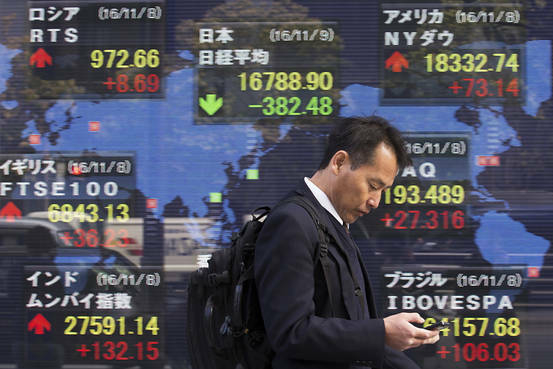 Stocks in Japan and Hong Kong initially dropped by more than 1% following falls in major U.S. benchmarks overnight, but as investors perceived overselling they stepped in and pushed the Nikkei and the Hang Seng back into positive territory. Hong Kong’s recovery was helped by southbound flows from mainland China. The initial pessimism stemmed largely from a third straight fall in major industrial stocks in the U.S. concern over the implications of protectionist trade policies. The Commerce Department said Wednesday that U.S. businesses seeking to avoid tariffs on supplies they import will face high hurdles. A puzzling decline in U.S. retail sales, meanwhile, hit stocks in that sector. The Nikkei’s NIK, +0.12% push back into positive territory was helped by the yen’s retreat off session highs. The benchmark was up 0.1% and the dollarJPYUSD, +0.256478% was back above ¥106, from an early low of ¥105.83. Stocks of large Chinese firms trading in Hong Kong logged gains, with Tencent0700, +1.08% up 0.9%, bringing this week’s increase to 4.6%. Ping An 601318, +2.47% , another common bet of mainland investors looking south, was up 3%. South Korea’s Kospi index SEU, +0.25% climbed from the negative into the positive, while Australia’s S&P/ASX 200 XJO, -0.24% pruned declines, though it was still down 0.2% — on course for a third-straight drop, done in by energy stocks. Stocks in Shanghai SHCOMP, -0.01% were largely flat, while benchmarks in Shenzhen, Singapore STI, -0.42% and Malaysia FBMKLCI, -0.27% were down by as much as 0.6%. A late-afternoon rally left New Zealand stocks up 0.4%, not far from Tuesday’s record. Oil futures were up, building on modest gains in the U.S. on Wednesday. Sharper-than-expected drops in U.S. fuel stockpiles outweighed concern over inventory gains in crude oil. Gold and silver prices were up.